Browse: Home / 2019 / January / 10 / Science: The Deep Ocean Plays A ‘Leading Role’ In Global Warming. It’s Colder Now Than During The 1700s. So there is a heat flux from the cold lower ocean to the warmer top? Cool! The key is “time to adjust” and similar range. It’s a big buffer. Not really. It is a reconstruction and therefore a model. Your fellow commentator spike55 got it right when he insisted on us having acceptable data on OHC only for this century. Everything before that is a rough guess-work and individual spikes in the data should not be taken too seriously considering the margin of error. 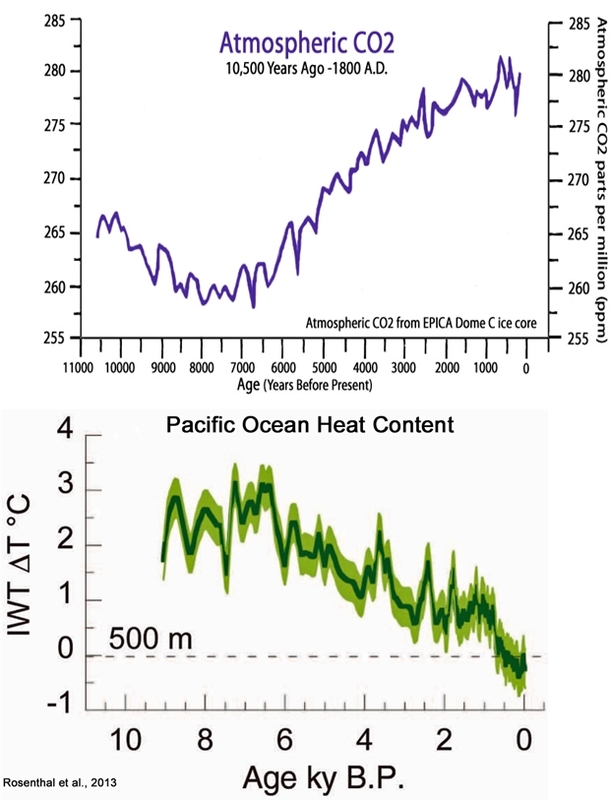 the lack of conspicuous correlation between ocean heat content and CO2 during the last 2,000 years would seem to undermine claims that atmospheric CO2 concentration changes drive zero-to-bottom global ocean warming. So what do you think is the reason why the Southern Hemisphere’s deep ocean began warming 1,000 years before the surface did? What was the cause? And why is the globe’s total ocean heat content (0-4000 m) so much colder today than it was during the Medieval Warm Period? Why has the deep ocean continued to lose heat, out of sync with the 700-2000 m layer and sub 2000 m layer? Why would CO2 concentration change significantly? If CO2 concentration changes are thought to be a significant mechanism driving ocean temperature changes — and they are in the AGW paradigm – even causing the Pleistocene-Holocene transition — there probably should be at least a partial correlation between CO2 perturbation and ocean temperatures. In other words, if the oceans warm significantly due to CO2 increases, and they cool significantly due to CO2 decreases, we should probably see a rise in CO2 that precedes or occurs at at least at about the same time as the heat changes. We don’t for either the MWP or LIA…assuming the CO2 values for those periods are correct (which is also a dubious assumption). We also don’t see any CO2 change when the Northern Hemisphere’s surface temperatures rose by 4 to 5 degrees C within the span of a few decades (14.7 ka). There were thousands of pirate ships on the seas during the 1600s to 1800s, when the sea surface temperatures were cooler than today. Today, there are only a few dozen pirate ships on the seas, when the sea surface temperatures are warmer. Therefore, pirate ships cause cooling, and the absence of pirate ships cause warming. Similarly, the CO2 concentration was 310 ppm in 1945. It’s 410 ppm in 2019. Between 1945 and 2019, the ocean heat content increased while the TSI decreased. 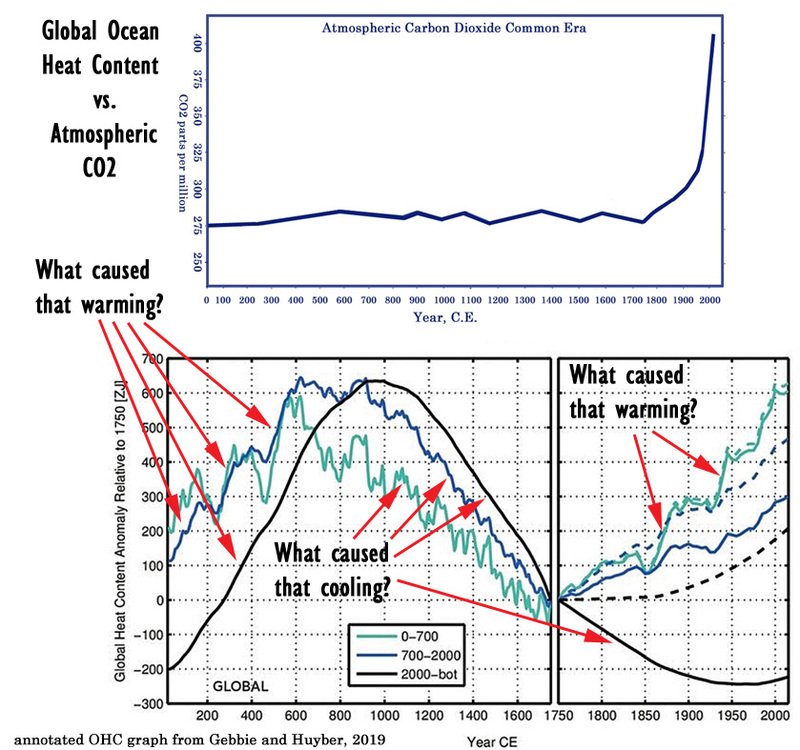 Therefore, the CO2 concentration increase is what caused the ocean heat content to increase. Again, those are logical fallacies, with the latter one closely resembling the AGW construction. What I wrote is not a logical fallacy. I didn’t write that CO2 concentration changes don’t cause OHC changes. I wrote that there is a “lack of conspicuous correlation between ocean heat content and CO2 during the last 2,000 years” (as illustrated by the graph that shows almost no CO2 changes as OHC rises and then falls dramatically). Is there a lack of correlation during the last 2,000 years between CO2 and OHC? Most people who aren’t close-minded would likely agree that there is indeed a lack of conspicuous correlation. There is no “logical fallacy” about pointing out that a correlation between two variables isn’t detectable. And this readily apparent lack of correlation “would seem to undermine claims that atmospheric CO2 concentration changes drive zero-to-bottom global ocean warming.” That’s also not a logical fallacy. As I’ve stated many times (and will proceed to just delete it from here on), the gun analogy doesn’t even come close to applying in this case. It’s just fluttery hand-waving worthy of the eye-rolls that your comments typically receive from the other commentators. So what do you think is the reason why the Southern Hemisphere’s deep ocean began warming 1,000 years before the surface did? If CO2 concentration changes are thought to be a significant mechanism driving ocean temperature changes — and they are in the AGW paradigm – even causing the Pleistocene-Holocene transition — there probably should be at least a partial correlation between CO2 perturbation and ocean temperatures. Nope. This is flawed logic. When A is a cause for B it doesn’t mean that everytime B is observed A caused it. Is that so hard to understand? In other words, if the oceans warm significantly due to CO2 increases, and they cool significantly due to CO2 decreases, we should probably see a rise in CO2 that precedes or occurs at at least at about the same time as the heat changes. No, we shouldn’t. See explanation of flawed logic above. Most people who aren’t close-minded would likely agree that there is indeed a lack of conspicuous correlation. There is no “logical fallacy” about pointing out that a correlation between two variables isn’t detectable. The fallacy is trying to argue with that there should be a preceeding CO2 concentration increase for every temperature increase if CO2 concentration changes really affect temperature, e.g. a correlation of both variables at all times. This is not how the mechanism works. Similar to guns killing people, other weapons can kill people as well. Arguing that there is no correlation for guns killing people in the more distant past (when guns weren’t even invented yet) and therefore guns likely don’t kill people in the present, is flawed logic or a fallacy. Oh yes it is and it’s also a very good example of you not even trying to understand how the mechanisms involved work. If something is underminded here, it’s the efforts of skeptics to be taken seriously. Your last paragraph is just ridiculous. It’s not about guns applying to anything climate related, it is about showing your flawed logic. If it helps, I’ll use the A/B terminology in the future. I’ll now go outside and tell myself that the notion of snow caused chaos on the roads gets undermined by the fact that there was no such thing in the past when cars didn’t exist. Have a nice day in your logic bubble. When A is a cause for B it doesn’t mean that everytime B is observed A caused it. Is that so hard to understand? At what point did I write that the correlation has to occur “everytime”? Answer: I didn’t. You’ve made up your own argument again…and then called the argument you made up yourself a logical fallacy. The fallacy is trying to argue with that there should be a preceeding CO2 concentration increase for every temperature increase if CO2 concentration changes really affect temperature, e.g. a correlation of both variables at all times. No, it doesn’t have to be “for every temperature increase”, it doesn’t have to be “correlation of both variables at all times“. Those are stipulations that you‘ve added, thus creating your own (fallacious) argument and attributing it to me. As usual. There can be occasional anomalies, occasional non-correlations, just as there are some non-correlations in the cosmic ray-cloud associations. Speaking of, isn’t it interesting that you have historically insisted that there be an at-all-times correlation between GCR-cloud variables, but you simultaneously insist that the CO2-temperature association does not need to be correlated but every-so-often — or even the opposite sign can occur for thousands of years like this — for you to nonetheless claim 100% causation. Why the inconsistency, SebastianH? it is about showing your flawed logic. You abjectly failed to do so. All you did was make up a phantom position that I have not expressed…and then shot that made-up argument down with a gun. I’ll ask again: Does the OHC record show a lack of obvious correlation between rising CO2 levels and rising OHC, and falling CO2 levels and falling OHC? Yes or no? 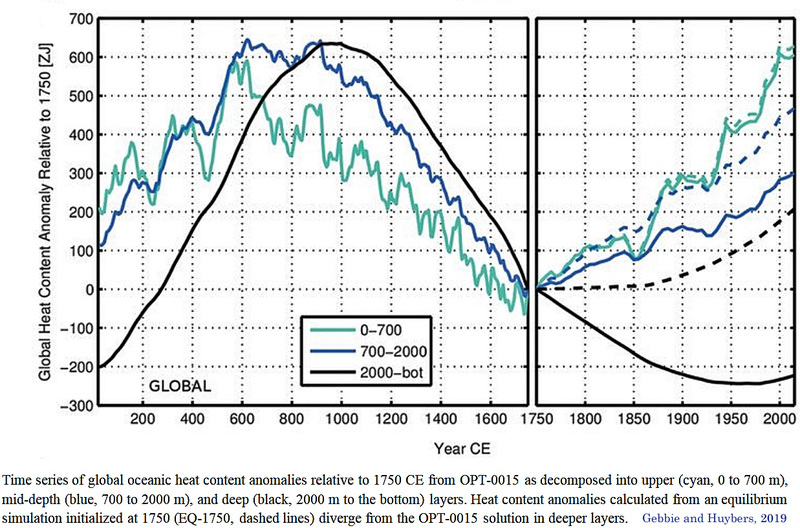 Is there a correlation detectable in these two graphs of CO2 and OHC for the last 2,000 years? Yes or no? No. I will answer that guns didn’t kill people in the distant past because there were no guns. But CO2 has always existed in the atmosphere, sometimes in considerably higher concentrations than today. And CO2 behaves today as it has always behaved and whatever it was not responsible for 10 or 50 or 100,000 years ago it is equally not responsible for today. Can you explain, just as a for example, by what mechanism the atmospheric concentration of CO2 causes changes in water temperature? You might just have discovered a way of reducing my heating bills. No. I will answer that guns didn’t kill people in the distant past because there were no guns. But CO2 has always existed in the atmosphere, sometimes in considerably higher concentrations than today. The times CO2 concentration was higher, mass extinctions happened. In the more recent past CO2 concentrations are mostly flat and follow the temperature changes of the surface. And CO2 behaves today as it has always behaved and whatever it was not responsible for 10 or 50 or 100,000 years ago it is equally not responsible for today. There was no significant artificial increase of the CO2 concentration before humans started burning fossil fuels. This is exactly the same flawed logic that Kenneth is employing. May I remind you of the first thing you wrote? There were no human emissions in the distant past, therefore human emissions didn’t cause climate change in the past. It’s called the greenhouse effect. You could reduce your heating bills if you move to a region where this effect causes higher winter temperatures than whereever you live. Where the CO2 originated is irrelevant. And higher levels of CO2 show little or no causal relationship with extinctions. Mankind has inevitably had an effect on the planet but there is no evidence that his “emissions” have played a significant part in that effect. And prattling on about the greenhouse effect does not answer my question about the mechanism by which CO2 warms water. If that were a rule, high CO2 = extinction, there shouldn’t be any animal alive today. Oh, and as high as CO2 concentrations have been throughout earth’s history, it’s almost impossible for them to have happened when CO2 was not high. As much as he makes up, and as much mileage as he tries to get with it, I’m thinking he gets paid by the word, …or maybe even the letter, for writing that tripe. SebastianH believes that high CO2 concentrations cause mass extinctions. After all, 30,000 species are going extinct every year…because we’re acidifying the oceans and uh, stuff. Where the CO2 originated is irrelevant. And higher levels of CO2 show little or no causal relationship with extinctions. It is not irrelevant because there is a difference between CO2 concentration changes happening when humans burn fossil fuels compared to as a response to temperature changes (e.g. outgassing of oceans when they get warmer). Do I need to explain? Mankind has inevitably had an effect on the planet but there is no evidence that his “emissions” have played a significant part in that effect. All the evidence points to this. Do you need a lecture about the basics of radiative heat transfer? Or are you one of those skeptics who say there is no greenhouse effect? Or better, that water isn’t as warm as it is because of it? There is hardly any species alive today that existed on this planet until now. It is the rule (with some exceptions, but that’s ok according to Kenneth). See graph linked in this comment above. SebastianH believes that high CO2 concentrations cause mass extinctions. What do you believe? What caused the mass extinctions of the past? And how does it correlate to CO2 concentrations? So why do you believe that high CO2 caused mass extinctions, SebastianH? What was the mechanism there? The times CO2 concentration was higher, mass extinctions happened. SebastianH’s commonly-employed logical fallacy is on full display here. 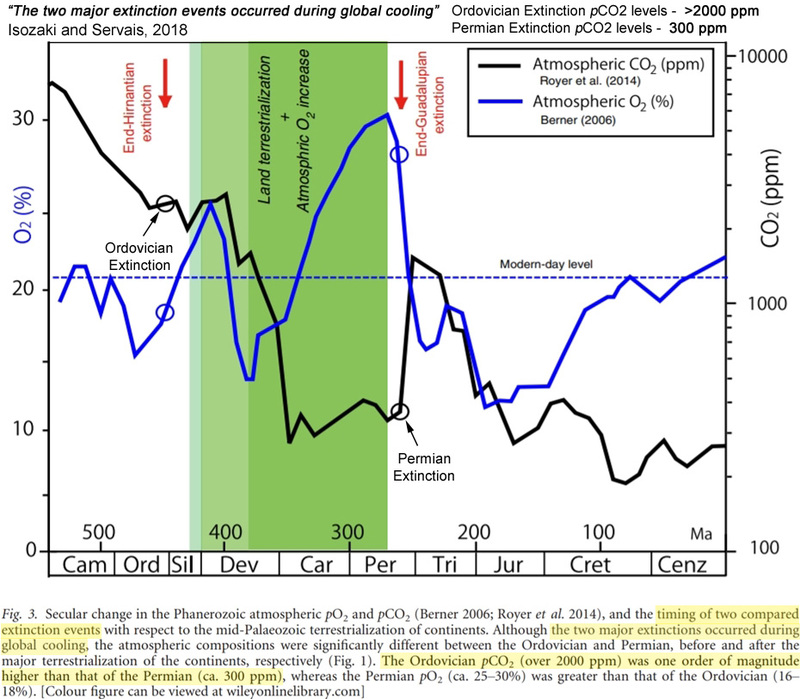 When CO2 was 4,400 ppm during the Ordovician, there was a mass extinction event. Therefore, the 4,400 ppm CO2 concentration caused that mass extinction. CO2 concentrations were 310 ppm in 1945. CO2 concentrations are 410 ppm today. The ocean heat content increased between 1945 and today. Therefore, the 100 ppm increase in CO2 concentration caused the OHC to increase. By the way, did you realize that the globe was covered in ice during the Ordovician…when CO2 levels were 4,400 ppm? How does that work out for you in the logical fallacy you employed above with the high-CO2-causes-mass-extinctions brilliance? As I have posted on this before, and I’ve since seen others saying in videos, the Cambrian explosion (when all modern body plans appear in the fossil record for the first time) occurred when CO2 was the highest it’s ever been and temperatures are as high as they ever get. See graph here. If CO2 were as dangerous for all life as they want us to believe, the Cambrian explosion would never have happened. Also, the idea that such high CO2 will dissolve calcium shells etc., is debunked by the fact that some trilobites had eye lenses made of calcium carbonate, and that there are many fossil shells throughout the geological record that didn’t disappear. CONCLUSION – High CO2 and global avg., temperatures are not threats to animals, and certainly not to plants. SebastianH’s commonly-employed logical fallacy is on full display here. […] Brilliant logic, SebastianH! This is fun. Are you really taking what I wrote literally and think that I am saying the CO2 caused the extinction directly? It sure looks like that to me. Correct me if I’m wrong. Nope, there is an actual mechanism acting. You are the one who argues that there must be correlations in order for CO2 concentration changes being able to affect the climate. Good to see that you can always find “science” to confirm your bias. Anyway, life always evolved adapting to the environment. Plants came into existence in a high CO2 world, why would they go extinct at that point? Same with all other lifeforms. Extinctions happen when adaption isn’t fast enough, e.g. when rapid changes of the environment/climate happen. Not a marine expert here, but I am pretty sure that is not what those would say is happening. Also, adaptation. Your dish washer can also wash with calcium rich water without leaving marks on your stuff. Wonder how it does that? There are ways to adapt to many conditions. Extremophiles can live inside sulfuric acid, boiling water and some do not die in a vacuum. Nevertheless they aren’t invulnerable to change. 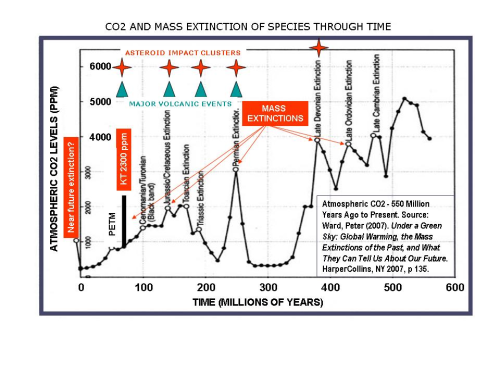 In the last ~500 million years major mass extinctions do correlate with rises of the CO2 concentration. First of all, I don’t think you understand what constitutes a “correlation” when we’re talking about 100s of millions of years and the CO2 concentration. Nor do I think you understand that even if there was a correlation between high CO2 and mass extinction events, this does not mean that it can be said that high CO2 was the cause of the mass extinction. But we understand that this is how you think (i.e., correlation = causation). The Ordovician extinction even occurred during a global cooling/ice age — when CO2 levels were high. The Permian extinction occurred when CO2 levels were 300 ppm…and global cooling and sea level falls and land glaciation destroyed marine and terrestrial habitats. Extinctions happen when adaption isn’t fast enough, e.g. when rapid changes of the environment/climate happen. Correct. Sudden-onset ice-ages, when global cooling lowers sea levels by over 100 meters, the land masses are covered in ice sheets, food for herbivores disappears, etc. I’m curious what “science” you are referring to that says high CO2 concentrations are threats to animals and plants. Can you identify this evidence? Lately SebH is bearing an ever increasing resemblance to Dilbert’s newly created AI. Here’s more info on that cult from the link I gave. I realized it might be a bit harder to find, with all those others to chose from. Note the graph SebH produces to support his “High CO2 = extinction” assertion, from climate activist John England. In particular, note that he has drawn it to show 100% correlation between CO2 and extinction events. WOW!!! No real scientist would EVER present a graph like that. Why? Because it NEVER happens that way, especially with data derived about events so very distant in time, and about which we don’t yet know all factors involved, and probably never will. Compare what the troll links to with this more standard version of CO2 and temperature. While close in a few spots, England obviously took great liberty to adjust the data to agree with his assertion. If you fill in “climate activist” for “storm trooper” and “data points” for “blast points,” in this short video, you’ll see at the end of it how I would rate England and SebH. I can’t emphasize this enough. The nonsense SebH is pushing is NOT “what the science says.” It’s what warmist activists are making believe it says, using grossly and desperately adjusted data to do it. Here’s the SebH link that “proves” CO2 caused extinctions. It’s a childish reconstruction of events bearing only superficial resemblance to what we have data to support. It is not to inform, but to instill fear, because you are more easily manipulated when you are afraid. On his website John Englander claims to have “dual degrees in geology and economics.” I couldn’t find what level his “degrees” were at, whether PhD, Masters, BS or BA, Associates, or other. What is obvious is that he is not a scholar, but a busy and dedicated activist. No wonder SebH links to his material. Yes, John Englander got the graph (and adapted it) from Peter Ward, who wrote a book in 2007 (Under a Green Sky) about how high CO2 causes mass extinctions. Ahah. Thank you, Kenneth. I was wondering where he got that propaganda from. It must have taken an immense stretch of fantasy to get those CO2 peaks and the extinctions to match up so perfectly. Looking at what I have on the extinction timing and the CO2 levels, he’s really way out on an imaginary limb there. As I wrote before, he doesn’t say what degrees, nor where they are from. And a list of publications wouldn’t hurt. That pic in that last link is a real hoot. Although they may exist, I don’t personally know anyone foolish enough to swim in water backing up from a storm drain. It’s part of the sewage system, as I understand. Presumably he doesn’t just put his bathing suit on to swim in waste water. If so, shouldn’t he have a bit more of a tan? Just asking. Probably due to a King Tide. They’ve been causing problems like that, along with Irma, etc. Nothing they shouldn’t have been expecting. It’s not like they don’t know when they are due. It would be laughable if these scam artists weren’t going to end up costing us a fortune that could be better used elsewhere, …almost anywhere else. No need to invoke AGW. Just look at the tide guages to see when to expect problems, based on what’s been happening for a century now, with no acceleration whatever. …which totally contradicts the basic premise of what the warmists have been howling about for decades now. But if it isn’t the heat, what is it? Is Englander saying it’s JUST the CO2 that causes extinctions? Really? That’s just too weird! These people are getting loonier and less internally consistent by the minute. Peter D. Ward (paleontologist) is apparently at least honest enough to admit that his wacky idea is an hypothesis, as opposed to a theory. Here’s a summary of it at un-Scientific un-American. It seems like he isn’t so much calling CO2 the climate thermostat as he is it’s emergency break. Well, he does think it raises temperature, which he asserts causes ocean mixing to cease, at which point the earth becomes a stagnant swamp, causing mass extinctions by gassing them to death with H2S produced by anaerobic bacteria. It’s telling that SebH calls this “the science,” when it is still just speculation, and not a very convincing one. ASIDE – how is it that, given we are not currently experiencing the dire conditions required by Ward for extinction, SebH believes a major extinction is nevertheless ongoing? Is that like how Al Gore’s time reversed CO2 that hasn’t risen yet causes temps to rise in eager anticipation? Anyway, Ward’s hypothesis seems to me to be contradicted by the Cambrian Explosion occurring at the highest CO2 ever, when temps were as high as they ever get. Like Jim Hansen, David Ward is (…drum roll…) also a Vegan. And that’s the same “Supreme Master TV” that Hanson was preaching on, if you will recall. Veganism = suicide by slow starvation. And it’s not bad enough that they choose to, but they have to try to con or force everyone else to join them. Are vegans intolerant, abusive and potentially violent? Now consider this – when’s the last time you saw a crowd of rowdy carnivores harassing the customers in the produce section? I would like to see a serious study done to determine if having an anti-social personality disorder was a precondition of becoming vegan, or if it was a consequence. In our world it wouldn’t be allowed because it would be considered too intolerant. In a saner world, it could be done but wouldn’t, because there’d be no vegans to study. (…because no one would choose to be one. that’s why. They’re finally looking in the right place for long term natural climate fluctuation: the deep ocean. The CAGW assumption that the oceans are a passive puddle will go down as the most colossal scientific error of all time. And the most wasteful. 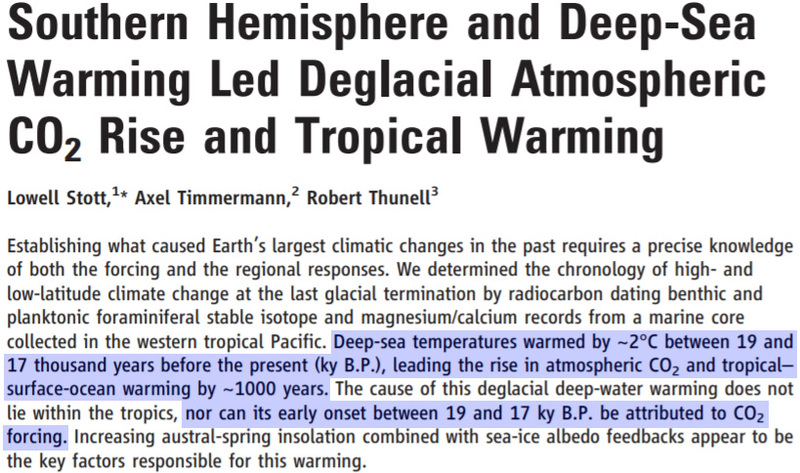 Deep ocean heat flux preceded by 1000-2000 years BOTH CO2 increase AND surface climate warming. Do show us how you wriggle and weave from there back to good ole CO2 prime causation. Struggling? Take a tip from nature’s natural born global warming apologist – the eel. Secrete a thick layer of mucus from your skin. The tie your own body in a knot. Maybe then we’ll believe that CO2 has somehow worked its way back to the beginning of the causation chain. Another day brings another theory. A little while ago climate change was mainly down to the sun. Now it is down to some mysterious processes taking place in the deep ocean. What will it be next week? Now it is down to some mysterious processes taking place in the deep ocean. What “mysterious processes” might you be referring to now, Skeptik? Is it brand new information for you that the heat flux precedes the surface temperatures by thousands of years, or that the Northern Hemisphere’s surface temperatures rose by 4 to 5 degrees C in a span of a few decades as CO2 concentrations were stable? Do you write this because it’s your belief that CO2 drives the temperature changes in the oceans since “no faults have been identified” in the GHG theory, and “nobody has, as yet, come up with an even vaguely plausible alternative” to CO2-driven temperature change? As a self-described skeptic, why would you claim that there are no “vaguely plausible alternative” theories other than the “no faults have been identified” GHG theory? Why not more skepticism considering the uncertainty values and error bars in CO2 forcing are gargantuan and unsettled? No faults at all in the GHG theory? Why are you so easily convinced? What “mysterious processes” might you be referring to now, Skeptik? Why not more skepticism considering the uncertainty values and error bars in CO2 forcing are gargantuan and unsettled? No faults at all in the GHG theory? Why are you so easily convinced? Imagine that someone could be skeptic of what skeptics are saying. Too far fetched? You seem to be easily convinced by the notion that everyone is faking it and you are being lied to by science and thus you need to make up your own mind or something like that. The only problem with this is that you are demonstrably wrong in many instances and don’t accept any explanation of why that may be the case. So yes, one should be very skeptical when a so called climate skeptic writes/says anything. I have always been skeptical of a dominant solar role in climate. For the same reason that I doubt a dominant CO2 role. Both these hypotheses make the same mistake of assuming a passive climate forced from outside. It’s not passive but active – the oceans and atmosphere are excitable media (to use the language of chaos and nonlinear dynamics). 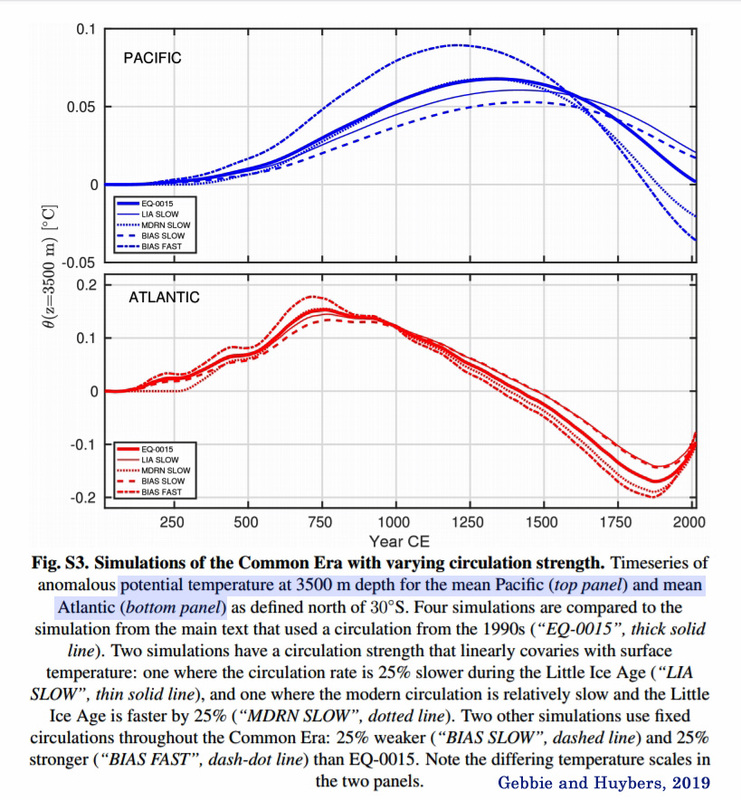 As an oceanography graduate (many years ago) it has always been obvious to me that oceanic circulation dominates climatic changes over timescales from decades and longer. (It’s not just me. Leaving aside skeptical narrative, there are hundreds of published papers in oceanography describing century and millennial scale ocean driven climate oscillation, for instance in the context of glacial-interglacial cycling.) The oceans hold vast heat capacity. The climate system of atmosphere and ocean is a dissipative open heat engine posessungtboth negative (friction) and positive (excitability) feedbacks. Therefore chaotic oscillatory behaviour is not merely likely but inevitable. Long term oscillations such as the PDO and AMO are the expected rule, not exception. The null hypothesis of climate change is that it is natural ocean driven variation in the integrated sum of vertical mixing bringing deep cool water to the surface, on regional or global scales. CAGW proponents have not come close to addressing this null hypothesis as an alternative to anthropogenic CO2 forcing of warming. Nothing new about the ocean. Vertical mixing and/or circulation as a means to increase the ocean heat content? How would that work exactly? Yes, we know that’s what you believe. By how much does a water body warm when the CO2 concentration above it is increased by 10 parts per million? What’s the Kelvin value for this CO2-heats-water physics measurement? 0.00000001 K? 0.0001 K? Do you know? Of course you don’t. And if you don’t have that information, how do you know that your belief is “truth”? You don’t. You un-skeptically just believe anyway. How is this science? Of course you don’t. And if you don’t have that information, how do you know that your belief is “truth”? You don’t. You un-skeptically just believe anyway. How is this science? I believe in the laws of physics. Applying them it would be very surprising if the forcings wouldn’t cause an OHC change. Or are you hoping that bodies of water somehow can differentiate between GHE forcings and all other forcings and just ignore the former ones? How do you know by how much a liter of water on your stove will warm when you “add” a certain amount of Joules? This basic law of physics is also warming the oceans. But the oceans aren’t as simple as water on your stove. There are currents in all directions, different levels of Joule input everywhere and on top of that the CO2 concentration can’t be controlled in the experiment you demand. Well, good for you. I believe I gave you this hollow win before, didn’t I? Maybe you also don’t believe me that the snow that came down from the roof hurt a person that happened to walk below at that moment? Maybe it was superman who just heated away the oncoming masses of snow, right? That’s how your “What’s the Kelvin value for this CO2-heats-water physics measurement?” argument sounds like. Like you are believing in the super natural that somehow changes the laws of physics in this instance or adds something to what’s happening that we seemed to have ignored all the time. Your fellow skeptic spike55 used to say that all the additional energy doesn’t end up in the oceans, but exclusively evaporates water. He didn’t account for the conclusion that this would rapidly increase the heat content of the atmosphere, but are you hoping for something similar? I believe in the laws of physics. Applying them it would be very surprising if the forcings wouldn’t cause an OHC change. Wow. So it would be “surprising” if increasing CO2 over a body of water didn’t cause that water body to warm. So you here acknowledge that (a) it’s not been physically established that it would cause a warming, and (b) even if it does cause a warming, you don’t know to what extent that it does. For all you/we know, it could be such a negligible warming (i.e., 0.0000000000000001 K for every 10 ppm increase) that it’s not even close to being detectable. 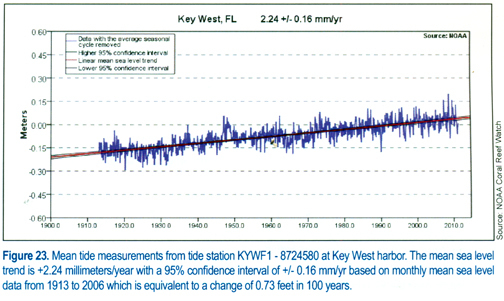 And yet despite not knowing for sure whether increasing CO2 causes water bodies to warm, or if it does, how much we’re talking about, you nonetheless believe that 100% of the ocean heat content increase since the 1950s – perhaps 0.1 C – was caused by CO2. You un-skeptically believe in 100% causation anyway despite having no real-world measurements or evidence that your beliefs are accurate. And then you have the gall to criticize and patronize and name-call those of us who actually are skeptical for not just agreeing with you that humans are the 100% cause of climate changes. Or are you hoping that bodies of water somehow can differentiate between GHE forcings and all other forcings and just ignore the former ones? Do you think it’s possible that there might be an orders-of-magnitude difference between the forcing power of CO2 to heat the oceans vs. the forcing power of, say, shortwave cloud forcing to heat the ocean? In other words, even if CO2 increases do warm the ocean, could this not be completely overwhelmed by changes in other parameters that induce/modulate changes in ocean heat? Or is this not even a possibility in your mind? How do you know by how much a liter of water on your stove will warm when you “add” a certain amount of Joules? This basic law of physics is also warming the oceans. SebastianH, for this “analogy” to apply, you’ll need to demonstrate that CO2 increases indeed do “add a certain amount of Joules”, and then you’ll need to demonstrate how much this “certain amount of Joules” is. You have neither. Maybe you also don’t believe me that the snow that came down from the roof hurt a person that happened to walk below at that moment? Maybe it was superman who just heated away the oncoming masses of snow, right? I stop reading when you pivot to these absurd comparisons that have nothing remotely to do with the subject at hand. Yes, SebastianH, we’re talking about Superman heating snow. Brilliant! You need to think about what we mean by “climate”. It is not primarily semi-theoretical abstractions such as ocean heat content or volumes of the ice caps. It is the atmospheric conditions at the surface and lower atmosphere where the biosphere are situated. What if during ice ages the deepest oceans are half a degree warmer? Then the heat content of the atmosphere and ocean are the same and by the heat accounting definition of climate, the climate is unchanged. But with Berlin one km under ice, that definition would have little meaning. Consider two facts. 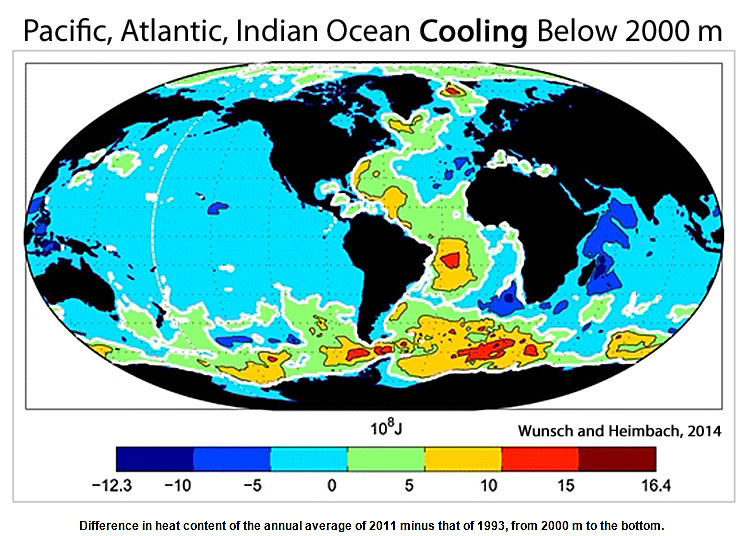 The ocean holds the vast majority of climate heat (1). And the oceans have a large vertical temperature stratification (2) with near freezing water at the deepest level even in the tropics where at the surface the water temperature may approaching 30 C. This means that vertical mixing of the ocean is the single most significant climate process. Everything else, including in the atmosphere, can almost be ignored. You don’t even need to think in terms of warmth moving from the bottom up – just a reduction in vertical mixing would warm the surface, relatively. Yes in the long term, if energy received by the sun 🌞 increases slightly, such as CO2 creating new radiation, the trick at the core of CAGW, then the whole system including the oceans will gradually warm. Granted. But this happens slowly since the oceans are big. On a timescale of decades or even more, there is so much ocean heat energy that the climate as a whole, in terms of heat energy accountancy, can be considered to be adaiabatic. That is to say, temperature change overall is zero sum game, warming in one place is balanced by cooling somewhere else. 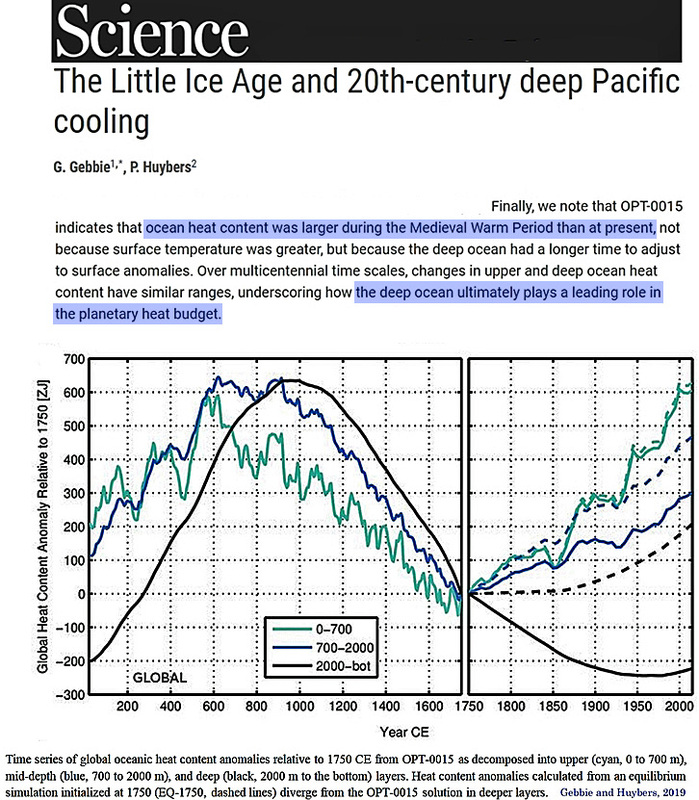 We do know already that slight increase in insolation will slowly warm the oceans. How slowly? Over thousands of years. How do we know this? That’s simple – since ever since the mid Pleistocene transition, every interglacial without exception has followed a peak of obliquity with a lag (delay) of exactly 6500 years. So it takes 6500 years for increased insolation to make its way to the deepest ocean and bring about a change in the temperature of upwelled water. As a professional climate scientist you will of course know all this. So we know that the time scale over which insolation changes result in noticeable climate change is 5000-10000 years; so we know already that the idea that increased backradiation from CO2 causing actual warming of the climate over a mere 200 years or so is transparent and laughable nonsense. It is of course just pseudoscience to back a Luddite political agenda. But another aspect of the primary role of vertical ocean mixing in climate change (climate is always changing, with or without humans) is that of attribution. Natural chaotic-nonlinear oscillation in ocean circulation (owing to its being as we already discussed, an open dissipative system with mixed positive and negative feedbacks thus inevitably in the Hopf bifurcation chaotic regime) will mean that there are always natural changes in vertical mixing. So the climate (meaning weather where people and plants live, remember) will be always, naturally, changing.. So this brings us to the final question. So the climate has warmed in the last 200 years. Is this due to (a) a process slightly increasing insolation that we know normally takes 6500 years to have a noticeable effect; or (b) from natural change in ocean circulation and vertical mixing which is chaotically changing all the time? You think a; I think b is more likely. You could just look up the mechanism. But, as usual, you prefer showcasing the ignorance we’ve come to expect from you. There is no null hypothesis in the IPCC-sponsored humans-cause-weather-and-climate conceptualization. It’s purposefully set up to be unfalsifiable. That’s why they shut down debate and ban contravening information. Wrong, “Skeptic.” Here, I’ll fix that for you. “‘no faults have been ADMITTED TO’ in the GHG “theory. !” But there are plenty there. First – There are plenty of “plausible alternatives,” the most significant is that the little warming that CO2 contributes is utterly insignificant in the scheme of things, i.e., NO “ALTERNATIVE” is needed! Second – If the problem is imaginary (which it is) then a “solution” isn’t necessary. And especially such a drastic “solution”as they propose. We are told that rillions of $$$ that could be better spent elsewhere must be squandered, causing immense pain with absolutely no gain. I posted this elsewhere, but it’s also appropriate here, so please see what Dr. Will Happer has to say. He gives a far more qualified and coherent presentation than any of the pseudo-Skeptiks here. Remember, folks, if a theory is wrong it’s not worth considering. CAGW is junk based on biased climate model junk, not real world observations, none of which support it. NOTE – Climate models are “junk” not because they are models, but because you CANNOT model climate. Even the IPCC admits it’s impossible. If “Skeptic” were correct, there probably would be a consensus. Unfortunately, there is not one. John Cook’s utterly biased claims have been disproved by numerous honest researchers. CO2 caused AGW is a house of cards, based on bad science and paranoid delusions. See also what Bill Gray has to say about that, here. Real scientists dissent, but fake skeptics pretend they don’t exist, that there is no alternative to their phony claims. I submit that we DO have an alternative to AGW, and that is that AGW is nonsense, and that there is therefore no need for any alternative. I would like to add that the advocates of cAGW, or ‘Anthropogenic Climate Change™’ (or whatever it’s called this week) is NOT a scientific theory as the nerds that put if together made it unfalsifiable. Therefore it is not a scientific argument, it is just an political, philosophical or even a religious argument. The observed scientific evidence for its main attributes are missing (the planet is not heating up alarmingly, there is no equatorial tropospheric hot spot, or the consequential alarming sea levels rise, and polar ice is quite within historic norms), however the minuscule rise in CO2 has led to some improvement in vegetative growth — much to the benefit of the planet. All in all it’s just political/religious pie-in-the-sky sophistry designed to keep most people fearful of enjoying life and living well, and thus under control and overtaxed. CAGW advocates just noisily bang the drum of “we have a ‘theory’ and you haven’t” , little do they understand that just having a ‘theory’ does not make it the correct, especially with so little observed evidence to support it. As far as I see it, the solar minimum is the greater threat, and we would be wise to be planning to mitigate against the worst that this scenario might bring to our ever-changing world. Thanks tomO, for your approval as well as your added thoughts on the topic. Whatever people need to tell themselves to sleep better and foster an unhealthy hate against everyone not conforming to how they think their bubble world works. So in Florida AGW doesn’t exist, good to know. Maybe that why people run around in shorts there even at single digit degrees (Celsius). Gee Sebastian, you offer made up arguments over and over as shown early in the thread. Why make up strawmnan arguments, logical fallacies, bogus claims and more? Why bother since it is so obvious to many here that you have no coherent argument to make. You are the fool who thinks, “30,000 species are going extinct every year”, but never offer evidence that it is happening. Al $$$ Gore thinks the Earths core is 1 million degrees C, Dutton thinks Sea level will be 20 FEET higher by year 2100. You are in good company with these goofballs. They run on their modeling delusions as badly as you do…. apparently. I am not, but you are right, I shouldn’t bother to comment here when it is so obvious that you guys will never change your minds. You are the fool who thinks, “30,000 species are going extinct every year”, but never offer evidence that it is happening. I cited the author of this claim, not my problem that you don’t seem to understand what he wrote. Rest assured, the company you chose here is a good one for you as well. You guys deserve each other. Stay in wonderland and leave the younger generation and everyone actually working in science alone. That would be great. Your 30,000 extinctions a year is a LIE! You still haven’t produced evidence/data to support your thumper claim, you were asked by others, still nothing. Meanwhile the Ocean waters are still cooling in the lower levels and also cooling in the upper levels through El-Nino’s, otherwise there would be little to no warming without them. Every published paper that gets posted here is always wrong to you, because it contradicts your delusional beliefs, which is why many here think you are a troll and a goofball, who acts if you are never wrong even when you were OBVIOUSLY wrong. It is not my claim. I am in no way a climate scientist or biologist that does the actual research and I suspect neither are you. Too bad the US government websites are currently closed, but I am sure it can’t be hard for you to find the actual data of global ocean heat content. It’s not cooling, heat content is increasing. I am very skeptical about what so called skeptics come up with. And no, I usually doubt the interpretations of you guys. But yes, it happens from time to time that the authors of this blog dig up a ridiculous paper and defend it with all they’ve got. Those times should make you very suspicious about their competence on this matter, but apparently, that’s not the case. You never doubt anything … you just believe you are being lied to by climate science and that everything is fake or nonsense. A big conspiracy if you will. I don’t care if you have to tell yourself that I am a troll to live with this kind of ignorance and denial. Have a nice time trying to convince yourself that you’ve got it right. See no evidence produced, which is not surprising since it doesn’t exist, as my link he completely ignored shows. Here it is AGAIN! You will ignore it because you are wedded to a lie that you can’t let go of. I posted a link showing that it was a lie, since there was never any such documented list of 30,000 dying off in ANY year. I provided proof that your 30,000 a year dies out was false and absurd. I never saw your link you claim exist, yet when asked SEVERAL times to produce it, you deflect and avoid posting it. The problem is that there was no such research in the first place, and you know it, refusal to produce it is proof you are a liar. You are proven troll with your proven lies, deflections and stupid replies. That’s the thing, you didn’t. You are using the same argument as Kenneth does so often, basically “there are only X records of species having gone extinct in the last Y years, therefore Sebastian is wrong”. You don’t even try to understand what the scientist meant by 30000 species going extinct every year. Skeptics seem to be good at forgetting and ignoring such things. You can also easily google it. If you like to imagine that Kenneth bringing this up all the time and me not taking it serious anymore counts as me failing to produce a link, well then … that’s your problem. refusal to produce it is proof you are a liar. Hahahaha … forgive me, I had to laugh. Not really and I suspect you know it. You just try to deflect from your inability to understand basic climate science by perceiving anyone threatening your reality as a troll. See you at the next Mensa meetup. Yonason will be there as well, I think. Oh my Sebastian continues to IGNORE my request of some alleged science research he claims exist, he employs the long standing habit of a dodge because he knows he is lying, until this thread I never asked for this alleged research link, thus his excuses are plain dumb. I did GOOGLE it, never found such a published paper, what I found was the link I posted earlier in the thread showing how absurd the large extinction rate claims are. It is indicative that you have ignored it several times I brought it up, because you have no intention of discussing any of it. The evidence is clear, you have no such paper, no desire to produce the paper YOU claim exist, for a purpose only Trolls understand. That is the only reality anyone can see here since your mythical paper never gets produced despite several requests for it. The ONUS is on YOU to produce the link, otherwise you have nothing. You avoid my reasonable request several times now, coming back with absurd excuses and deflections, I have no choice but to call you a liar. How can I understand what this “phantom scientist” said when you don’t post the link? You are so gob smacking bad at this. The ONUS is on YOU to produce the link, otherwise you have nothing. Since SebastianH is probably too embarrassed to admit where he got his “data”, I’ll provide the link in his stead. Why do you believe that losing 30,000 species every year for the next 33 years is not catastrophic, SebastianH? Graph is based on a mathematical model linking species to habitat loss developed by Edward O. Wilson and others. Assumptions: Total number of species = 10 million background extinction rate from fossil records is one extinction per million species per year; estimated total number of species 10 million – background rate = 10 species per year. 1. Edward Wilson estimates 27,000 species are currently lost per year. By 2022, 22% of all species will be extinct if no action is taken. 2. Niles Eldridge estimates 30,000 per year currently. 3. Georgina M. Mace using a different methodology based on extrapolations from the current lists of endangered species arrives at a figure of 14-22% loss of species and subspecies over the next 100 years. 4. Paul Ehrlich, using another approach based on total energy use estimates extinction rates at 7,000 to 13,000 times the background rate, (70,000 to 130,000 species per year) which he says is higher than figures based on data for higher orders of animal indicates, but we have little data on insects and micro flora and fauna. He really said exactly that, eh. WOW! So, basically, he’s admitting that warmist/watermelon activists can make up anything they want, and we have to prove it isn’t true. Yes, I know that’s what they do, but I’ve rarely seen one come so close to admitting to it. Not the sharpest tack in the box, for sure. Also, as we know, even when we do show that their unsubstantiated claims are false, they just ignore that and keep on making them. I knew it was absurd because there was no list of actual EVIDENCE of losing 30,000 species, BY NAME. It was a modeling exercise only, which people like Sebastian fall to the floor in ecstasy over, the rest of us rational people wouldn’t take such garbage seriously. He quickly bowed out after one more silly statement with you. He apparently is willing to ignore the IUCN official tabulations on Extinctions in favor unverified/non falsifiable models. He runs on pseudoscience crap so willingly, that is sad. Oh really? The onus is on the other side? I suppose skeptics would like that. I don’t care if I have nothing. I am not a scientist and I am certainly not your science-finding-nanny. Please refrain from using this kind of language. It merely serves as a show of character to saner people reading this blog and you don’t want skeptics to look bad, do you? Oh sorry, I don’t have my catalog of climate science links with me all the time and I am not inclined to google stuff for you guys in instances where you guys bring up old topics again and again where you imagine you’ve one an argument in an effort to discredit your opponents. Well, note the difference between extinctions of a named species and observed/assumed background extinction rates. Ehm, you are the ones making stuff up as you go. Wildly inconsistent stuff. And you demand from us to show you evidence that it is not the case. That’s the reality my random internet troll friend. So who knows if 30000 species a year is a relatistic number for the background extinction rate in modern times. Bringing this up all the time to defend yourselves by attacking me is weird. You don’t do that to Kenneth or Pierre, do you? Mr. Richards provided the link you refused to provide, it make clear you love unverified modeling assumptions. There is no actual EVIDENCE of losing 30,000 species a year, no actual names of known species being lost is posted by you or your ecoloony heroes such as Eldridge and Ehrlich at all. It is modeled assumptions only all the way down…, no listed names of species lost published. You are truly a joke with it. there is no actual evidence for this world being real and not a mere computer simulation either. How does that make you feel? no listed names of species lost published. So you don’t understand what a background extinction rate is. Noted. Anyway, this is what one scientist wrote. How this has become something you use in attacks against me personally when you feel the need to defend yourselves … is beyond me. Would you like to attack someone from your side as well who made a statement based on nothing more than a hunch? A certain prediction from 2008 about the temperatures in 2020 comes to mind. If you get mad about someone referring to something a scientist wrote, how will you react when it’s just a hollow claim based on a feeling? Your replies are getting too stupid to respond to anymore, this is my last one. It is clear you have no EVIDENCE that it is happening, thus you have nothing that is real to offer, just made up modeling assumptions. take note of the synonyms. unverified modeling assumptions are not based on real evidence, or they would have used evidence instead of models. I am done with your here. As if we needed ANY more confirmation that SebH is nothing but a troll. And not a very smart one, apparently. About on a par with the AI depicted here. SebH pretends to care about species going extinct, yet he wants to see vastly many more raptor and bat abattoirs installed, despite the threat that wind turbines pose to those species survival. Like all watermelon greenies, he a hypocrite, …a fraud. Your logic is sound and I bow to you my all-knowing internet friend. Congratulations! Yet again more empty sophistry and utterly cr@p analogy. Why did you bother? You’re as convincing as any newspaper’s astrologer (i.e. not at all). I still wonder how much you get paid for commenting here. A perfect description of the Warmists, and all Leftists in general. It’s SebH’s side that owns the hate. …and the lies, obviously. It must be nice for people to believe that their CO2 supposition and all it’s political ramifications are so true, especially as there has been so little observed atmospheric warming, or any of the the much professed impending doom they screeched about. After 40 years you would think there would be something of worth to what they predicted. But no there’s not. There’s no skepticism for these cAGW, Climate Change™ ‘dangerous CO2 warming’ advocates, for they truly believe they and their CO2 suppositions are correct 😉 All this despite the reality of observations such as those listed here in this blog-post. Even after 40 years of no dire climate calamity, there’s just evidence of the usual variable weather. However as the solar minimum progresses it is quite likely all the expensive, flaky, unsustainable boondoggles will be seen as nought but expensive political mischief and futile, but for some profitable, tilting at windmills that they truly are. So you think the climate didn’t change enough? Is that it? All this despite the reality of observations such as those listed here in this blog-post. So you really need bad stuff to happen before you act and don’t ever try to prevent bad stuff from happening? But then again, the “precautionary principle” get not applied often in the US either. Maybe that’s a culture thing. Ehm, so if you are losing $1000 per month and rapidly approach bankruptcy, you’ll stop doing something against it when someone helps you out and hands you $2000 to give you more time to solve the money-losing problem? Even despite you knowing that you are still losing $1000 of your own money each month? So you really need bad stuff to happen before you act and don’t ever try to prevent bad stuff from happening? Oh please tell us, SebastianH, how we can “prevent” the extreme weather “bad stuff” from happening! How can we stop tornadoes? More wind turbines and solar panels? How about hurricanes? (Never mind that observations show hurricane frequencies are declining…) More wind turbines and solar panels? How do we prevent floods or droughts? (Never mind that observations show no detectable water cycle changes in the last half-century…) More wind turbines and solar panels? But then again, the “precautionary principle” get not applied often in the US either. Maybe that’s a culture thing. Does the “precautionary principle” apply when there is no real-world cause-effect evidence that shows humans can control the weather…by using more wind turbines and solar panels? Ehm, so if you are losing $1000 per month and rapidly approach bankruptcy, you’ll stop doing something against it when someone helps you out and hands you $2000 to give you more time to solve the money-losing problem? So money and bankruptcy and someone handing you money is so similar to the humans-cause-weather paradigm that you believe in that you thought it an apt analogy in this case? Sheesh, this is just preposterous. Science is not that good on estimating how CO2 stratifies in seawater. This open access paper at https://agupubs.onlinelibrary.wiley.com/doi/full/10.1029/2018GL080099 is titled ‘Air‐Sea CO2 Flux Estimates in Stratified Arctic Coastal Waters: How Wrong Can We Be?’. Our results demonstrate that surface stratification can introduce substantial uncertainty into studies of the surface CO2 system in coastal Arctic waters. Notably, averaging over the entire 2014 data set, the underway system on the ship, which drew water from 7‐m depth, implied that the waters of the eastern archipelago are a consistent atmospheric CO2 sink (averaging 4 mmol m‐2 d‐1) during the summer. In contrast, samples from the shallowest rosette bottles (at 1–3 m) indicated a drawdown nearly half as large (Table S3, 2014 data). Extrapolating over a 90‐day ice melt period and beyond the area of an individual cruise, as when data are incorporated into regional or Earth system models, would compound this error; for example, an error such as what we observed, extrapolated over the entire Arctic basin, would constitute 15% of the total annual drawdown estimated for the high Arctic Ocean (Yasunaka et al., 2018). Further, strong gradients in TIC and AT between samples collected by the surface rosette and from small boats (Figure 2) indicate that even the shallowest rosette samples often do not accurately represent undisturbed surface waters. If you want to actually stop those things we need to build a weather control system like Sci-Fi authors imagine them to exist in the future. I am guessing you don’t really meant to ask how to stop tornados, hurricanes and floods, right? The efforts are to keep the climate stable and thus prevent extreme weather from getting worse, not to stop extreme weather. In my world it applies to everything. Better safe than sorry. Why would you intentionally risk everything just because you like burning fossil fuels. Why are you so attached to that form of power usage? Hmm, at this point I doubt that you understand a word of anything you read. You have a preset mind and only stuff that confirms what you already think gets through. Everything else sounds like an offense to your intellect to you and thus gets tuned down or misinterpreted on purpose. Beyond weird is the appropriate term. Again, it is a waste of time replying to you. The efforts are to keep the climate stable and thus prevent extreme weather from getting worse, not to stop extreme weather. And what, specifically, are the “efforts” that will “prevent extreme weather from getting worse”? How do we do that? More wind turbines and solar panels? Why would you intentionally risk everything just because you like burning fossil fuels. What, exactly, am I risking? What’s the “everything”? What’s going to happen to me, to us, as a consequence of our petroleum-based-energy-use sins? Then why do you carry on doing it? Are you such a slow learner? And what, specifically, are the “efforts” that will “prevent extreme weather from getting worse”? Decarbonizing the energy supply, stabilizing the CO2 concentration and therefore limiting the total heat content increase over the next few decades/centuries despite increasing usage of energy by mankind. Using the Sun’s output to achieve that seems obvious. Nuclear fission and fusion and indirect usage of solar energy like wind and hydro seem obvious too. Studies about the economic consequences of climate change (past, present and predicted) exist. Read them. Understand them. As a U.S. citizen with probably less than 50 years left to live you aren’t risking much for yourself. But as a U.S. citizen your are contributing to climate change in a disproportionate huge way. Apparently it’s news to you that adding heat energy to the climate system has been found to decrease the intensification of extreme weather and lead to fewer storms and hurricanes and droughts and floods… Perhaps this is why the Little Ice Age had so many more droughts and floods and hurricanes than we’ve had to endure in the 20th and 21st centuries. We live in one of the most quiescent periods of the last millennium. So even if “decarbonizing the energy supply” could actually lower the heat content of the oceans (and we don’t know if does, or if so, how much), cooling down the oceans and reducing the heat in the climate system might actually intensify storm energy and the hydrological cycle. Considering the abundant evidence that warmth and higher CO2 levels (as opposed to cooling and lower CO2 levels) green the planet, lengthen growing seasons and strongly enhance crop yields, lead to fewer early deaths, allow botanical and mammalian species to thrive…and that less damage from hurricanes, storms, droughts, floods occur in warm climates compared to cold ones (see above)…the economic consequences of “climate change” have been a boon to the world. as a U.S. citizen your are contributing to climate change in a disproportionate huge way. Wow. So I’m having a “huge” effect on the climate…because I live in the U.S. Perhaps if I tried hard enough I could lengthen the growing season even more than I already have by changing back to using incandescent light bulbs. Right? Are you suggesting the laws of physics don’t apply here again? Who wrote something about cooling down the oceans and reducing the heat content? Your imagination is special. Maybe you should write a novel! I am sure it would be very entertaining. Wow. So I’m having a “huge” effect on the climate…because I live in the U.S. The U.S. is one of the top emitters of GHGs per capita. Perhaps if I tried hard enough I could lengthen the growing season even more than I already have by changing back to using incandescent light bulbs. Right? Since you are a fan of quatification, by how much do you think would your CO2 emissions increase by doing that? It is news to me since climate science says that’s not the case. Do observations (i.e., science) indicate that the hydrological cycle has intensified as a response to rising CO2 emissions? No, they don’t. Has the “wet-gets-wetter-dry-gets-drier” paradigm been realized? No it hasn’t. That’s what the newly published science says. What observational evidence supports your belief that hydrological cycle and extreme weather events have been increasing globally as a consequence of rising anthropogenic emissions? Let’s see what you have as far as evidence. Anything? Are you suggesting the laws of physics don’t apply here again? What “laws of physics” might you be referring to? The U.S. ranks 16th in the world in per capita emissions after having dropped by 25% in the last few decades. I know without a scintilla of doubt that every time I turn an incandescent light bulb on I melt ice in the Arctic. How much? Well, about 4.2 square cm for every 25 minute interval that the light bulb stays on. How much Arctic ice did you melt by driving your Mercedes, SebastianH? I’m sure this has been seen before but it worth a repeat as it really strikes at the heart of what is wrong with the Germany electricity and economic model. An interview with Dr. Philipp Lengsfeld as he talks about the gross errors made in the German experiment of too many subsidy payments for solar and wind generation, trying to abolish the nuclear power option, while German CO2 emissions levels continue to rise and rise. 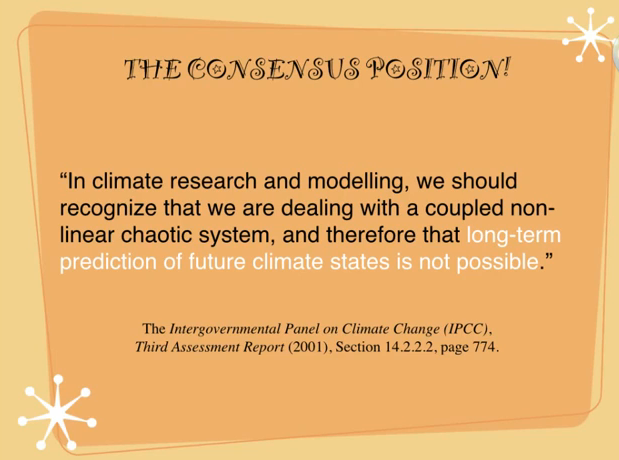 Unstable people who claim they know how to “stabilize” what the IPCC correctly calls a “coupled non-linear chaotic system” that can’t be modeled. Yeah, let’s put them in charge. What could go wrong? German Co2 emissions aren’t rising. And yes, mistakes regarding the subsidies were made. We still subsidize Diesel and have been subsidizing coal to a very large part. We also learned that using tenders results in lower prices than setting a price by commitee. Should have done that a lot sooner for solar, wind, etc. What is wrong with abolishing nuclear power? This country chose to do so and you’ve got to respect that. Switzerland did so as well. It is an interesting option to reduce CO2 emissions for sure, but it is too expensive and storing the end products of nuclear fission is still unsolved. Sure they can and they most likely will. It’s in our best interest to become a carbon neutral civilization. That’s the endgame anyway, so why bother waiting? So fossil fuel companies can make money while we wait? Who pays you for your self destructive opinion? As Patrick Moore has shown in a video I posted recently, planetary CO2 has been decreasing ever since the Cambrian. While it has some ups and downs, it’s overall concentration has been steadily decreasing. If you extrapolate that decrease into the future, you see that unless more is added to the atmosphere, it goes below 150 ppm in under 2 million years. When that happens, plants die. When plants die, all animal life will follow. You claim to be worried about extinctions, but seem blissfully unconcerned about that nightmare scenario. Why aren’t you willing to apply your precious “precautionary principle” to prevent the MOTHER OF ALL EXTINCTIONS?! Are you really that suicidal? You have some nerve accusing anyone of being self destructive! I finally got around to watching that video. He certainly seems sane enough. Maybe there’s hope for Germany yet? If you extrapolate that decrease into the future, you see that unless more is added to the atmosphere, it goes below 150 ppm in under 2 million years. When that happens, plants die. I am sure skeptics are good at doing these kind of fantasy extrapolations. This is fun! What else do you predict? Just stop trolling with that nonsense, will you? While your replies are entertaining, they lead to nowhere and are just designed to aggravate. Have a nice day! I apologize to the Kamikaze pilots for comparing you to them. You are nothing like them. What they did, however foolish and mistaken, was for what they thought was a noble cause, protecting their homeland. What you do is because you enjoy attempting to inflict pain. They were misguided warriors. You are a self absorbed anti-social sadist. I would wish you a nice day, but since that would probably involve you’re hurting someone or something, I won’t. Excellent video from and excellent scientist.